Habit: Subshrub, shrub, +- strongly scented. Stem: many, slender, from thick, woody root-crown, short-lived, brittle, often leafless. Leaf: simple, opposite (or distal alternate), sessile or petioled; blades linear [triangular], entire to dentate or irregularly lobed. 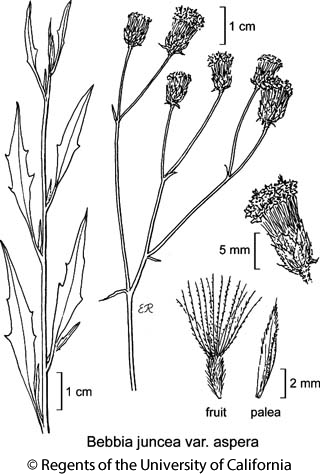 Inflorescence: heads discoid or disciform, 1 or in open, rounded cyme-like clusters; peduncle slender; involucre cylindric to bell-shaped; phyllaries graduated in 3--5 series; receptacle rounded, paleate, paleae folded around fruits. Pistillate Flower: 0--8; corolla yellow to orange, radial. Disk Flower: 20--50; corolla yellow to orange; anther tips ovate, acute; style tips tapered, acute. Fruit: club-shaped, compressed, 3-angled, brown to black; hairs ascending, white; pappus of 15--30 +- plumose bristles. Stem: 5--15 dm, much-branched, forming a rounded bush <= 3 m diam, glabrous or short-bristly. Leaf: 1--3(9) cm, linear, entire or with few, sharp, pinnate lobes, drought-deciduous. Inflorescence: heads few; peduncles 1.5--6 cm; involucre 4--15 mm diam; phyllaries 1--7 mm, lanceolate to linear, acute. Flower: corolla 6--10 mm. Fruit: 2--3.5 mm; pappus 6--10 mm. Chromosomes: 2n=18. Ecology: Common. Dry, rocky slopes, desert plains, washes; Elevation: < 1500 m. Bioregional Distribution: SW, D; Distribution Outside California: to southern Nevada, Texas, northwestern Mexico. Flowering Time: Generally Apr--Jul Note: A 2nd variety occurs in Baja California. Unabridged Note: Specimen from eastern side of SN that was basis for report from SNE in TJM (1993) is almost certainly from DMoj, not SNE. Citation for this treatment: David J. Keil 2012, Bebbia juncea var. aspera, in Jepson Flora Project (eds.) Jepson eFlora, http://ucjeps.berkeley.edu/eflora/eflora_display.php?tid=6785, accessed on April 20, 2019.